Sudbury schools are based on the empirically verifiable conviction that children and adolescents learn most effectively when they are able to decide for themselves what and how they learn. 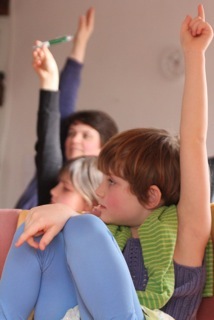 Children are inquisitive by nature. Left to themselves, they want to learn and to grasp – both literally and metaphorically – the world they live in so that they can orientate themselves. Effective, joyful learning takes place when people can pursue their own inclinations in an atmosphere which is free of anxiety and pressure. This opens up new perspectives and broadens experience. Under these circumstances, making mistakes becomes one of the most valuable paths to learning. For pupils at Sudbury schools, learning is generally a spontaneous process which takes place in a mixed age environment (~ 4-19 years) through play, communication or watching others. The pupils gather knowledge all the time by reading, researching, experimenting etc. They form working groups, organize projects and often develop a wide range of artistic activities. They also initiate courses of more formal instruction which is then provided by staff members, external freelance instructors or competent fellow pupils. They enjoy the freedom to allocate their time – whether ‘working time’ or ‘playing time’ – according to their individual rhythm and stage of development. In other words, they develop their own individual curriculum. The result is a particularly effective and sustainable form of learning. Staff members are available to provide help and support as and when it is needed. There is no form of performance assessment (unless specifically requested by a pupil). This does not mean that there are no rules in a Sudbury school environment. The freedom of the individual is limited wherever it encroaches on a neighbour’s freedom or that of the community as a whole. Each person’s limits are defined by rules laid down by the group as a whole. School affairs are handled in assemblies which are convened on a weekly basis. Children, adolescents and staff members form a democratic community. Each individual enjoys the same rights and is subject to the same obligations as everyone else, regardless of age or standing. ‘One person, one vote’: Decisions are taken strictly on the basis of equal voting rights for each member of the community. The effectiveness of the Sudbury approach towards self-determined learning has been demonstrated continuously for over 40 years in many parts of the world. Sudbury alumni have learned to stand up for their interests and needs, to recognize their strengths and weaknesses and to develop particular competence in those fields which they regard as being relevant and important for the achievement of their aims in life. They are typically self-confident, self-aware, committed, creative, open and tolerant. Particularly noticeable is their above-average willingness to take on responsibility. The greater part of the school-leavers goes on to some form of higher education, whilst the others have used their time in the school to find out what kind of non-academic occupation goes best with their skills and temperament. "Sudbury pupils have the advantage that they know a lot about themselves and what they want to do. They simply don’t let other people tell them that they aren’t up to doing this or they are not able to do that. When they believe that they can achieve something, they don’t let anything stop them. (…) I think Sudbury pupils have never had serious problems getting to university, or getting to wherever they want to go, because people see who these pupils are. They see that they are self-confident and they know what they are doing and what they are talking about."